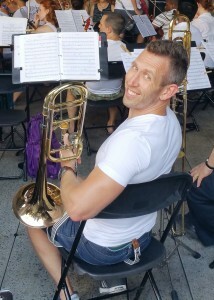 Jason is trombone section leader and joined QUO in March 2014. I joined QUO after moving to New York City two years ago. Before I moved here, I attended a rehearsal with my boyfriend Matthew Hadley (oboe section leader and principal English horn) where I actually subbed in on trombone with a borrowed horn (since I hadn’t traveled with my own). From that experience I knew I wanted to join, and did so as soon as I could! I love taking visitors to Central Park. Out-of-towners are always so impressed with the park and its ability to remove you from the hustle and bustle of the city around you. It’s also fun to see visitors realize that Manhattan isn’t only concrete and steel – there’s nature too! It’s also fun to take visitors around the Flatiron district – its one of my favorite parts of the city. 3. What musical symbol best defines you and why? The accelerando. I love the buildup to something different and exciting, and tend to speed up in anticipation of an event or big change. That feeling that you get when you hear the orchestra start to pick up tempo – that’s a feeling I’m very familiar with. 4. How long have you been playing trombone? I have been playing trombone since the sixth grade in 1991. I originally had my heart set on the french horn, but after seeing my lips my junior high band director handed me a trombone mouthpiece and upon hearing me buzz loudly on my first try, signed me up for trombone (which was my second choice) – and I’m so glad he did! (my sister got to fulfill my original dream of playing french horn) I played all through junior high and high school, and also in my university symphonic band where I was able to perform as part of a European tour. After college I packed up my horn, but always wanted to find another chance to play. Ten years later I joined the Houston Pride Band (Houston’s LGBT community band) and now I’m here! Question from Stephanie: Who is your musical hero and why? I thought hard about this question, trying to think of a composer or performer that is a musical hero of mine. But thinking about this, I realized there is one person I almost always think about when listening to or performing music – my dad, Jerome Svatek. My dad is a life long lover of all things music, growing up in a family where polka music was the soundtrack, and eventually playing the sousaphone in high school. He took me on my first trip to hear the Houston Symphony, and I remember sitting with him listening to different classical works to help me decide what instrument I should play. His love of music was and still is an inspiration to me, and like him I have a very emotional response to music. Listening to music often brings up memories of listening to songs with my dad, and I always wish he was able to hear me performing pieces that I know he would love.